Translucent urinals permit measuring ease and visualization of contents. Specially designed notched handle conveniently hangs on most styles and sizes of bedrails. Handle is a separate chamber and will not fill during use. Snug fitting odor shield is marked "Urinal" to avoid other uses. 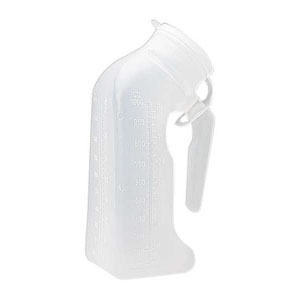 Wide base improves standing stability whether empty or full. Patient conforming neck angle and opening helps confine contents when urinal is positioned horizontally. Can conveniently be placed either vertically or horizontally and features a large loop handle for easy handling. Graduated: 25cc and 1 oz increments up to 1000cc.